Gary from McAdam has some new videos up on YouTube. Gary got the St. Stephen train with NBSR 2319 returning to McAdam with 9 cars. This shows the NB Southern crane driving (on dirt) through the McAdam yard. Here's NBSR 9801 running light in the McAdam yard. And finally, NBSR 2319 and 2612 pulling up to the McAdam station as they arrive from Maine. Thanks for posting those, Gary! I love that this blog inspires people to contact me with photos and videos. :) I had an email from Mr. Georges Long, who was looking at my web site. He was at the May 10 St. Andre derailment of CN 308 for his work and took a number of amazing photos. It looks like this tank car slid for a while before stopping. Here they are draining the fluids from a damaged Honda before destroying it. Check the whole album out! And while you're there, look at all Georges Long's work. He has some great photographs there. Kevin G sent me some photos from a chase of VIA 14 and 15 he did back in August. I'm embarrassed to say I haven't moved them from my inbox since then. I'm way behind on email. That being said, here are what I think are the best of them. Thanks for sending them! I understand Kevin's friend Mario took these photos while Kevin was taping the trains. First, VIA 6427 leading Operation Lifesaver VIA 6411 and VIA 14 somewhere between Moncton and Amherst. Next, CN 4724 and another unit in Gordon Yard at Moncton. Finally, VIA 6400 leads VIA 15 out of Moncton. I quite like this one. As you may know, CP 29 is currently stuffed and mounted outside the Canadian Pacific headquarters in downtown Calgary, Alberta. CP 29 was famous for being one of the last three CP steam locomotives in regular freight service, the other two being 136 and 144. They worked between Chipman and Norton on the CP line, and they continued working because of the very light bridges on the line. They were eventually replaced in 1959, I think. CP 29 eventually came to the Salem and Hillsborough Railroad where it was returned to service and used on the passenger runs. It always ran in company with another engine (except for one time). Tragically it was damaged in the 1994 fire, and after a few years it was returned to CP, who cosmetically restored it and put it on display. Brian Barchard sent me these two photos of CP 29 in Calgary. More details on CP 29 are available at the New Brunswick Railway Museum website. Ron Grant reported on Sunday (Sept 23) that the road crossing is done. It's not connected at the wallboard plant end, and the end nearest Irving Paper needs more ballast and bolts but it is physically connected. Alert Ron Grant noticed that NB Southern put the rail line across Bayside Drive in Saint John on Saturday, September 22. As he told me: "They routed all traffic through the south side of the Dry Dock property. I came home tonight and it's all paved. The crew is still there cleaning the street before opening Bayside Drive to traffic. When they are done they will still need to join the road track to the track in the Dry Dock property where the traffic was rerouted. A lady spokesperson stated arms and lights will be in place within 2-3 weeks." The smokestacks in the background are NB Power's Courtenay Bay generating station. The crossing is right about in the middle of this map. Check out the shiny new blog called As I chase trains I wonder if I'll ever get that perfect shot. I've posted his YouTube videos here before. Good to see you online! The Miramichi Crime Stoppers are holding their 4th Anuual Model Train Show on my birthday, Saturday, September 22, 2007 at the Northumberland Square Mall (in Douglastown). The event is from 10 a.m. to 4 p.m. with many layouts and sales tables. For more information contract W Blake Johnstone at 773-6859. Every railfan has their moments of self-doubt, and their "oh, crap!" moments. I had both tonight in Bathurst. New Brunswick East Coast Railway's ore train 586 from Bathurst to Brunswick Mines comes on duty at 18:00. I was at the NBEC yard at 16:10 and nothing was going on. Two NBEC MLW RS-18s were down in the yard and NBEC 1851 was dead by the station. I figured I had some time, so I went over to East Bathurst to look at the Smurfit Stone facility. While I was there, I heard train 586's crew bring their train out onto the main and then call the RTC. "Oh, crap! I'm out of position!" I had hoped to get them at the iron bridge near highway 11, but that was clearly out of the question. I decided to head for Nepisiguit Junction, as I knew they would have to stop to line the switch for the Nepisiguit Subdivision. I headed to the end of Smith? Court and jogged the last few feet into the wye at the Junction. Soon I heard them rumble around the corner and pull up to the switch. Give the conductor credit, he lined that switch so fast that the train stopped for a mere 25 seconds. At 18:56 train 586 rolled onto the Nepisiguit Subdivision with NBEC 1868 and 1821 leading 14 CN covered gondolas and 5 AOK covered hoppers. I resolved to try different locations than last Thursday's chase. I did get him at the first highway 430 crossing at 19:03, albeit only with video. I took a side video shot at 19:07 to show some of the pretty colours coming out. I decided to go behind the Blue Mountain? racetrack and get him coming around the corner there, rather than take the second highway 430 crossing. It was a pretty good location but there's not a lot of room to step back from the train there. The light was really starting to fail at 19:14. I took one more side video shot a few minutes later just before the track went away from the road. I decided to give up the chase, as the light was getting pretty bad, and go to Nepisiguit Junction to wait for VIA 15. I got to the overpass over the Junction by 19:40 and set up my tripod on the overpass. There is lots of room to shoot westbound trains there without fear of cars. I waited.. as the light went away. Soon I snapped the "night shot" feature on my video camera to have some hope of shooting anything, and waited.. Here was my moment of self doubt. Did I miss the train? Was it early coming into Bathurst? No, that couldn't be, because I heard nothing on the scanner. But where was it? I hate those moments. They had to stop to reline the switch at the west end of the junction, so I got to the VIA station ahead of them. They rolled in at 20:29. I went to the head end and tried a few time exposures of the engine. I think I did it a bit too long. What do you think? They rolled on out at 20:35 with 6415, Operation Lifesaver 6411 and 16 Renaissance cars with Assiniboine Park at the end. Oh, and this morning VIA 14 arrived in Miramichi at 10:09 and left at 10:16 with 6400, 6417, 7011, 7223 and 14 other Renaissance cars plus ReveLstoKe Park. YouTuber clam502 has posted a couple of videos of NBEC mainline freight train 403 on YouTube. Here it is in Charlo. Be patient - the train shows up around 00:50. And a close view of the train coming into Campbellton. I had a quick trip to Saint John Tuesday morning and here is what I saw on the way. As I approached Chesley Drive in Saint John, I saw three NBSR units running light toward Island Yard. On the scanner they said they were going to pick up 40 cars to bring back to Dever Road. At 09:40 NBSR 2317, 9803 and 2610 entered Island Yard. I wasn't able to get ahead of them, so no pictures. As I passed Island Yard I saw CN 5757, 2454 and I think 5678 by the shop building, ready to go out as CN 405 later. A portion of a local train was on the track by Staples paralleling Russell Street, with ten cars and caboose NBSR 79635 ready to lead the way. No engine in sight! On my way out around noon, I saw SW1200RS NBSR 3703 and GP9 3701 shunting the west end of the Dever Road yard. I took a little video with my Canon S3 and here it is. P-Y posted this video of CFMG 402 in the rain as it headed to Mont-Joli, Quebec. Here is a video of train 587 for your viewing pleasure. It features NBEC 1821 and 1868 from Friday. I blogged about this yesterday morning. Here's a quick little video of CP 4563 idling in McAdam, for you Alco-philes. Despite the warnings of rainy weather, I decided to head to McAdam to see 4563. How often does an MLW visit the southern lines? With my two youngest kids in the van, we set off. My game plan was to meet the eastbound excursion train at Prince William Station, get a few quick shots of the runaround at Harvey, then get the westbound at Harvey Lake before proceeding to McAdam. We arrived at Prince William Station at 10:00. I fully expected to see the excursion train by 10:20, but that time came and went without any train. It was a bit of a challenge to entertain two kids by the side of a track, but we found some anthills and flowers and did some jumping to pass the time. Finally I had to break the snacks out. Around 10:50 I heard some rumbling in the distance, and at 10:56 we saw a distant headlight. Prince William Station is a very long piece of straight track, and it wasn't until 10:59 that the train passed us. It had NBSR 2610 and 2317 pulling the three passenger cars (5537, 5448 and 5471, all ex-VIA, ex-CN) and caboose NBSR 422990. We packed up and went to Harvey. The two engines uncoupled and ran down the main line out of sight, then came back up the siding. They were ready to roll by 11:37. We left and went to Harvey Lake. As I was walking toward the point with a tripod in one hand and my toddler in the other, I heard the rumble of the engines. Darn it! I gently set my loads down and brought my camera out to take this one picture. I'm glad it turned out OK.
We arrived at McAdam and saw quite a few cars parked by the McAdam station. The CP 29 model was parked in front of the station and NB Southern had parked a number of their MOW machines by the shop building. CP 4563 was still in the main yard, so I drove down there with my sleeping kids. I took a few shots and ended up in the cab talking with the gentleman who came down from the Canadian Railway Museum to look after the engine. Quite a nice fellow. 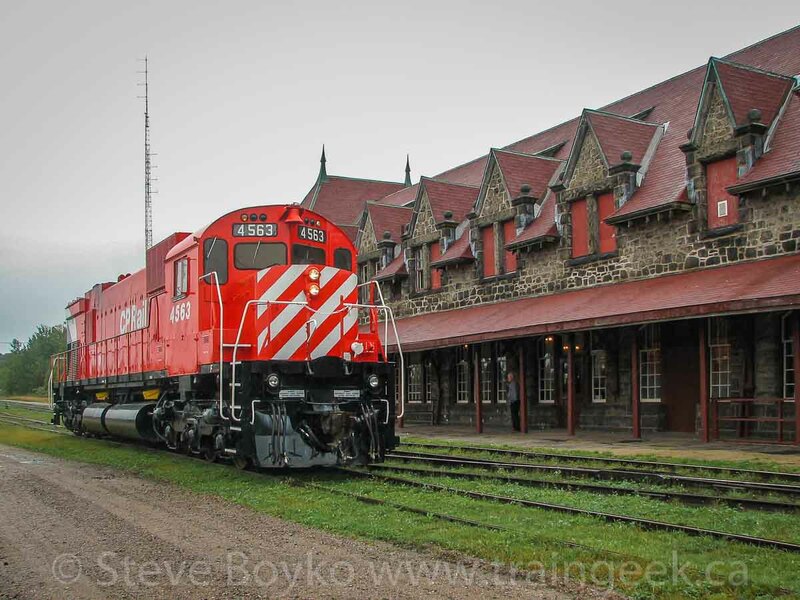 The excursion train arrived at McAdam at 12:25 and unloaded. I talked with a few people I knew (hi Art, Wendell, Danny, Gary) and met a few people I had only known online or by reputation (hi Mike, Ron). I took the kids for lunch at the Family Restaurant, and when we returned for a quick look, 4563 had been moved over beside the station. The excursion train was turned on the wye, and at 14:16 they left McAdam. The conductor on the tail end, Gary, told me they had 175 passengers for the Harvey trip. At 14:20 the NBSR eastbound freight arrived at McAdam, with NBSR 2318, 2612 and 9802. I'm not sure, but I don't believe they made any setoffs or pickups. Here's a shot of CP 29 by the station. The gentleman in the photo is the fellow from Delson. We went and had some ice cream, and when we were done, the eastbound freight was ready to go. They had pulled up to near the highway crossing and were waiting to find out where the passenger train was before they could leave. They pulled out at 15:00 with 9 boxcars, 9 autoracks, 3 tank cars, 5 loaded wood chip cars, and 3 empty NBSR log cars (29 cars). They made good time to Harvey, and passed through there at 15:34. We headed home at the end of a long but good day. Kudos to NB Southern for being such a good host railway, and to the McAdam crew for hosting the event at their beautiful station. Gary from McAdam has uploaded a walk-around tour of CP 4563, starting from looking into the cab. Today I went to the Bathurst area, and fortunately saw a few trains along the way. In Miramichi CFQC 3000 and NBEC 1819 provided the yard power, while NBEC 6900 sat at the back of the yard. I had just exited highway 8 onto route 360 when I heard VIA 14 tell the RTC that they just arrived at Bathurst. I stopped here where the railway crosses 360 and waited a few minutes until VIA 14 showed up. It passed at 09:14 with VIA 6400 and 6417 leading a Renaissance train, with Revelstoke Park bringing up the rear. By the way, what's up with the weird lettering on Revelstoke Park? Did VIA run out of lower-case stencils? Later, I heard NBEC 403 arriving at Bathurst at 17:00. They did some shunting, then left quite quickly at 17:35 or so. I handily beat them to Beresford and taped them there at 17:43. They had NBEC 6901, CFMG 6907, CFQC 3000 and NBEC 1819 as power. I guess 402 must have brought a new pair of RS-18s down to Miramichi. The train had the usual mix of boxcars, tank cars, wood chip loads, loaded lumber cars, covered hoppers, CN covered gondolas, and the inevitable 17-car ram of Ultramar tank cars for a total of 63 cars (33 loads, 30 empties). Back at Bathurst, NBEC 586 was ready to go to Brunswick Mines by 18:40 with MLW RS-18s 1868 and 1821 on the point. Since I was going that way anyway, why not do a little chase? They crossed route 430 the first time at 19:00. You can see the shadows were getting really long. I really like this shot - I just wish it was brighter tonight. I got them next at 19:05 at Sewell Road, although I think the video turned out much better than the stills did. A quick run down the road got me to the next highway crossing just before the train did, so I just took stills at 19:10. My last catch was a few km up the road, at a private crossing just before the track and the road part ways. At 19:18 the sun was pretty much below the horizon. Train 586 had 15 blue NBEC ore cars, 26 covered CN gondolas, and 5 AOK covered hoppers. In case you feel nostalgic, you can read about my last visit to the Nepisiguit on July 17, 2006. Brian Barchard got my "heads up" and caught 4563 coming into McAdam today behind NBSR 9801, 2612 and 2317. Thanks for sharing those, Brian! My man Gary shot some video of 4563 shunting McAdam today! OK, so it wasn't running, but it was right behind the engines doing the work. CP 4563, the MLW unit coming to McAdam for this coming Saturday's event, is on the NB Southern eastbound freight. It is currently in Mattawamkeag and should be in McAdam by 15:00. I'm told it will probably be stored on the stub track by the dam until Saturday. Kevin G posted a nice video of VIA's Ocean at Gort (outside Gordon Yard) with VIA 6400 on the head end. This is VIA 15 as it leaves the Moncton area. Frank Jolin shot CP 4563 in an MM&A train going east into Maine today. Reader Chris Metallic was up near the Upsalquich River and took some photos of the old INR (International Railway) railway line, as well as the old CN 78496. Here's the iron bridge over the Upsalquich River. This photo shows the foundations of the old station. The caboose is on the property of a former CN superintendent. The owner said the caboose was built in 1930, presumably by CN. Thanks for the photos, Chris! There will be a railway event at McAdam on Saturday, September 15. I understand there are events planned for the afternoon, with registration starting at noon. The highlight for railfans will be former CPR M-630 #4563 on display. This is a public event. NB Southern will run their passenger excursion train from McAdam to Harvey from around 10:00 to noon, for employees and their families only. I understand there is going to be a notice in the Daily Gleaner, so keep your eyes open for that. I have a family event in the late afternoon but I expect I will be in McAdam for the morning and early afternoon. Can't miss the rare CP unit! EDIT: Thanks to Danny McCracken for the details. Here's a photo I took of CP 4563 at the Canadian Railway Museum (Exporail) on July 6, 2005. Local railfans noted the arrival of IRSI's RDC 6202 to Halifax Friday in the middle of CN train 148. It was in Halifax for CN's Safety Days on Saturday. It took CN and VIA employees and family on a number of round trips between the Halifax Intermodal Terminal and Rockingham (not a great distance). Long-time readers know that I have a love-hate relationship with RailPictures. I love it when I get my photos into their database, and I hate it when I get rejected. Well, now I'm a "real" photographer. I am now in their list of photographers, since I have 25 or more photos in their database. May I say... "woo hoo!"